THE DEFENCE FORCES are currently conducting a search for explosives at a derelict building in Sandyford, Dublin. A spokesperson for the Defence Forces told TheJournal.ie that there is an ongoing operation after gardaí requested assistance because there may be a number of dangerous devices at that location. They said the building is in a rural part of Sandyford. The Defence Forces have a team of core engineers conducting the search which the spokesperson described as “pretty painstaking”. “They’ll go through the whole building in suits with metal detectors and will demolish walls or parts of the building looking for devices,” they said. 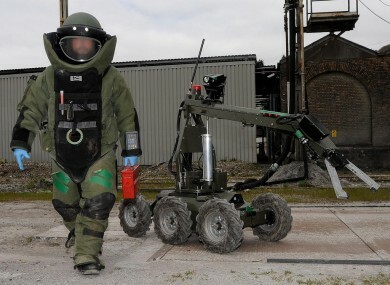 A “volatile” War of Independence Mills 36 grenade was already discovered and made safe by a bomb disposal team at 1.18pm today at the building and the search is continuing. The spokesperson said it is likely the team will complete the operation tomorrow. Email “Army conducts 'painstaking' search for explosives at derelict building”. Feedback on “Army conducts 'painstaking' search for explosives at derelict building”.